The eLearning Library Subscription provides unlimited access to over 50 courses, assessments, and training curriculums designed to enhance job-specific, self-paced learning for one full year. Special pricing available for Groups. Train your entire team! Libman Education is a leading provider of online courses focused on hospital coding (ICD-10-CM, ICD-10-PCS, CPT) from beginner to advanced, as well as credential prep (both AHIMA and AAPC), and specialty topics (including home health, HIPAA, and pediatrics). Training aides such as bookmarks and flashcards. Excluded courses and products are available to subscribers at a discounted price. • Multimedia and interactive online course offering independent self-study. • Online Flexibility! Materials available 24/7. Work at your own pace — save time and travel costs. • Earn Certificate of Completion and CEUs. • To receive CEU credit, students must achieve a passing rate on the course assessment(s). • Courses are self-paced. For planning purposes, assume 1-3 hours required for each CEU. • Unlimited course access during the subscription period. • Financing available through PayPal Credit. • Codebooks, textbooks and other resources may be required for eLearning Library courses and are not included in the cost of the subscription. See course descriptions at www.libmaneducation.com for specific details include cost. “LOVEEE Libman! Very happy with the classes I’ve taken.” — Linda C.
“Thank you for all your help and for making this more bearable. Coding is not easy! (Not that I thought it would be by any means). There were times when I thought it was too easy, and times when I wasn’t sure if it was for me, but you were always able to point me in the right direction and that really helped! Thank you for everything and I will keep in touch!” — Mackenzie M.
“I would like to take a moment and commend you and your organization. I have taken advantage of some of the free webinars offered in the past. They are always very professional and well-done!” — Deb D.
“Thank you so much for the phone call and your assistance … I appreciate it!” — Maureen Z.
Textbooks and other resources may be required for Libman Education eLearning Library courses and are not included in the subscription. See course descriptions at www.libmaneducation.com for specific details including cost. Depending on the topic, many courses require students to have coding manuals in addition to the textbook. 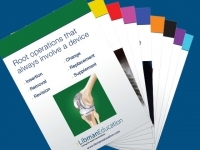 Do you want to know how the Libman Education eLearning Library can work for you or your team? Managers may view the Manager Orientation Video to learn how to navigate within the online Learning Management System, manage their team, review reports, and harness the power of the Libman Education eLearning Library. Students may view the Student Orientation Video to learn how to to decide which course is right for them, how to navigate within the online Learning Management System, and how to earn CEUs and Certificates of Completion for their efforts.